Topped with loads of crunchy cornflakes, these cookies look tantalising and taste brilliant. 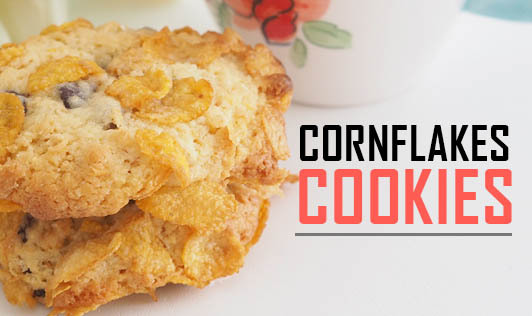 A mild lacing of lemon juice and vanilla essence enhance the flavour and aroma of the cornflake cookies. 1. Pre heat the oven to 180°C. Put the butter in a mixing bowl and beat it till it is soft and creamy. 2. Add castor sugar and mix well. 3. Add the flour, baking powder, lemon juice and vanilla essence and mix well to a dough consistency. 4. Divide it into 15 equal portions and roll in the crushed cornflakes. 5. Place these on a baking try and bake it for 15-20min. 6. Cool it and store in an air tight container.